Sessions will be held in The Cooper Dean Room at St Hugh's College. See below for details. First Session on Tuesday 13th October at 7.30pm will be character creation, with lots of help on hand for new players. Come along to discuss character ideas, flesh out characters already sent in, and to meet the current members of RPGsoc. First IC Session will be on Tuesday 20th October. Arrive at 7pm for a 7.30pm start. This room is at St Hugh's College, between Woodstock and Banbury Roads. See google maps. 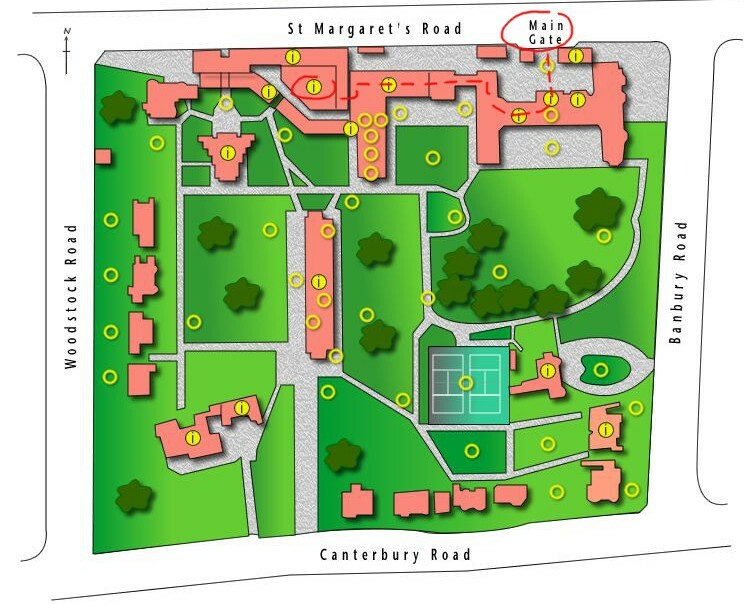 Please gather at the main entrance on St Margaret's Road (marked “Main Gate” on the map below) and wait for a member of the GM team to let you in. We'll have someone waiting there from 7.00pm until about 7.15pm. If you arrive after this time, tell the porters you're looking for RPGSoc and they should let you in and direct you to the appropriate place - go into the main building, turn right and follow the corridor all the way to the end, as shown by the dotted lines on the map. There you will find stairs down to the bar; we will be occupying the rear section.